In collaboration with Scott Gallager (WHOI) and Alberto Scotti (UNC), our lab is studying the effects of internal bores and trailing internal solitary waves on zooplankton distribution. The field component includes two cruises in Massachusetts Bay, where the internal tidal bores are highly predictable. The field approach consists of deployment of moored and towed instrumentation. 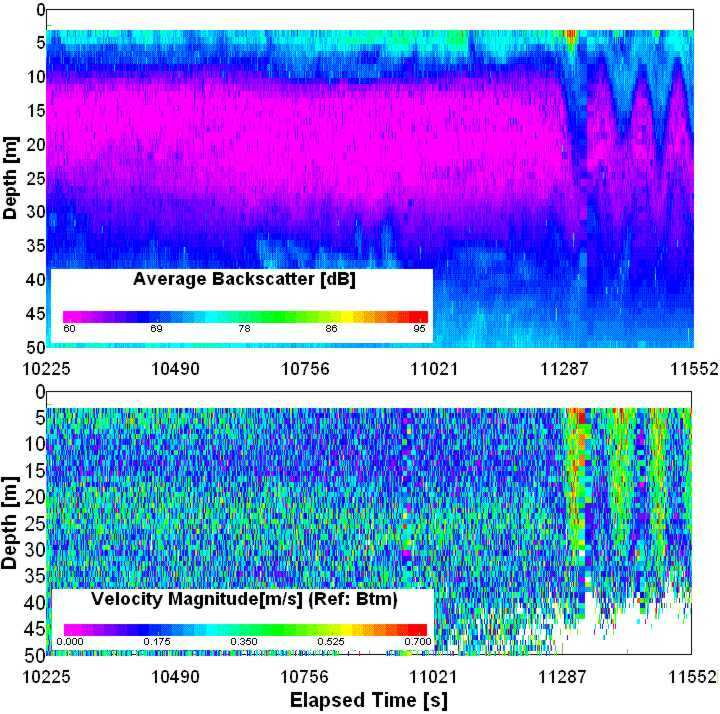 Below are (1) interpolated data of backscatter and velocity magnitude, and (2) a photo of the leading edge of the bore in (1). The bore is traveling towards the West, presumably from Stellwagen bank to Scituate, Massachusetts. (Photos and data taken from the RV Connecticut on 18 September 2001.) The photo was taken about 1:30 h later than the Doppler current meter data. 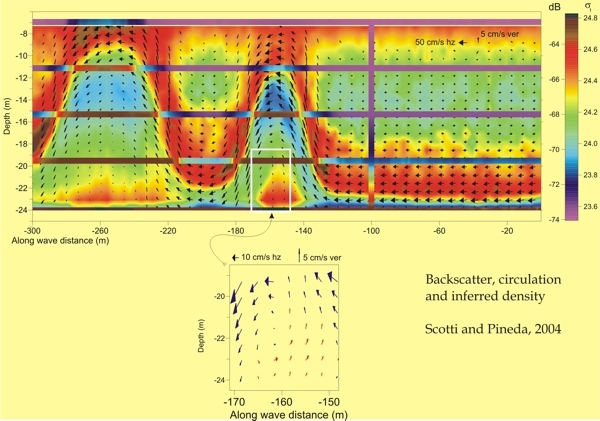 Top, interpolated backscatter (top panel) and velocity magnitude (bottom panel) with depth (m) and time (s) obtained from the shipboard Doppler current meter. Bin size is 1 m. Boat steaming towards Stellwagen bank (Massachusetts) at about 3-4 knots. Patterns in backscatter and velocity magnitude reveal an internal bore followed by internal solitary waves.11552 s is about 9:11 EDT, 18 Sep 2001. 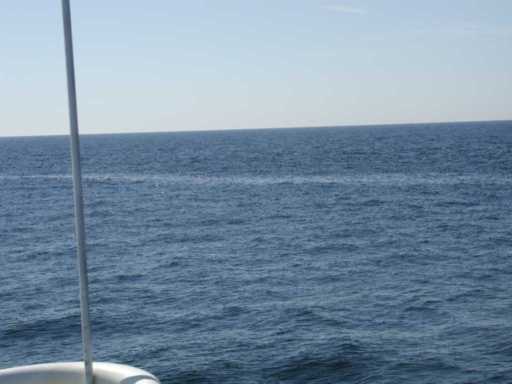 Bottom, a surface slick associated to the leading edge of the bore in the panel above observed from the bow of the RV Connecticut. The photo was taken 91 minutes after 09:11 EDT, 18 Sep 2001. The boat was steaming onshore, in the direction of propagation of the wave. Click here for more photos of the cruise. 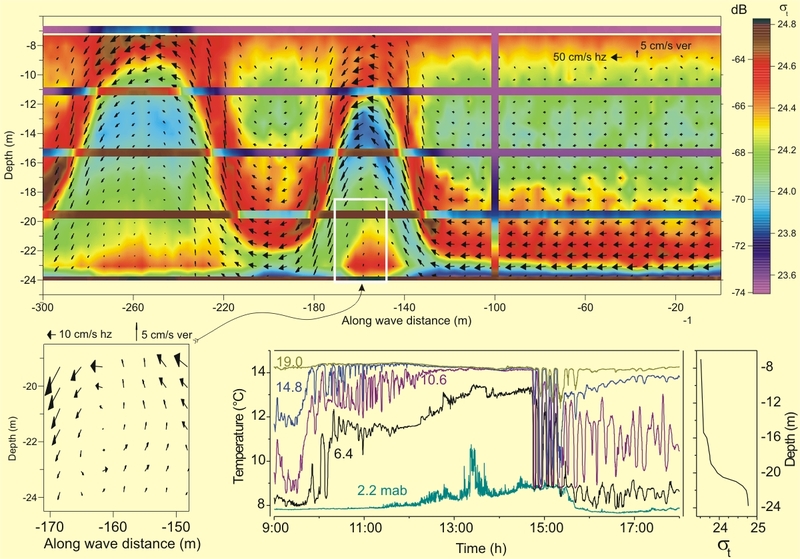 Waves propagating shoreward at 21 cm/s on September 2001, near Scituate, Massachusetts Bay; water depth is about 25 m. Background color is backscatter and bars are density. Currents are shown in a frame of reference moving with the wave speed (that is, currents pointing to the right are faster than the propagation speed of the wave). The white box shows a trapped core, and is reproduced in the upper right. (Modified from Scotti and Pineda, 2004, GRL 31, L22307). © Jesus Pineda and WHOI. All rights reserved.